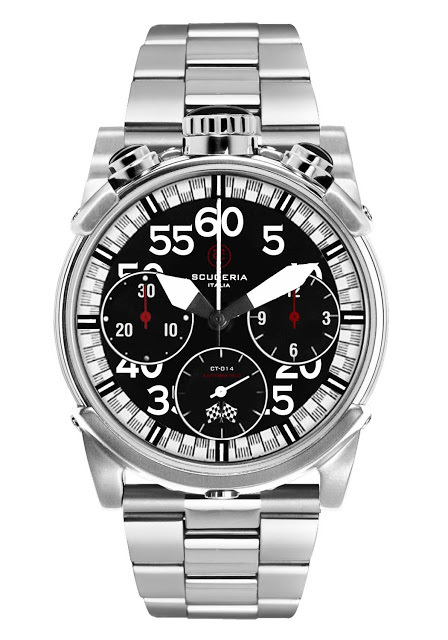 CT Scuderia is an Italian brand making affordable, motocross-inspired timepieces. 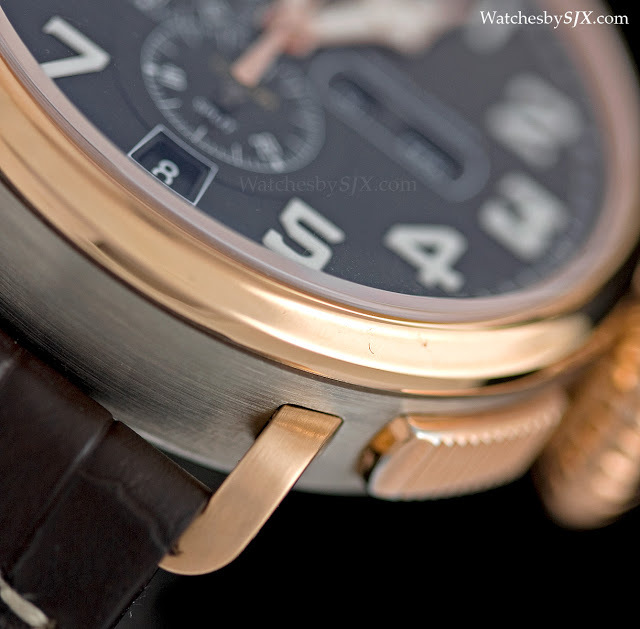 At Baselworld 2013 it presented its first mechanical watches, including several chronographs. 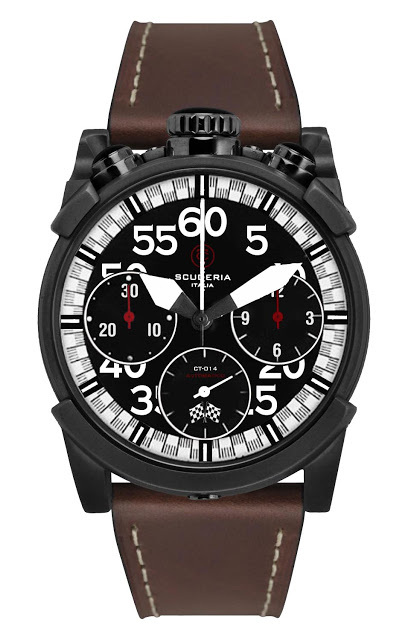 All the ContaTempo Scuderia (CT Scuderia for short) timepieces have the same 46 mm case with four lugs attached by screws, and the crown at 12 o’clock – a look inspired by sporting stopwatches. 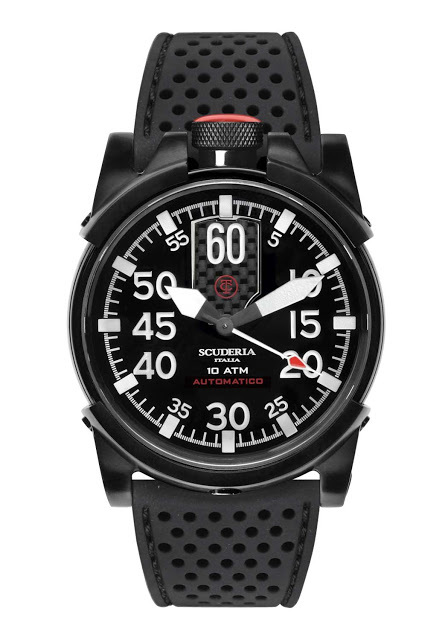 Fitted with sapphire crystals, the cases are water resistant to 100 m, while the case backs are black PVD coated with lacquered segments in the colours of the Italian flag. Initially available only as quartz timepieces, the new line of watches from ContaTempo Scuderia all have automatic movements. 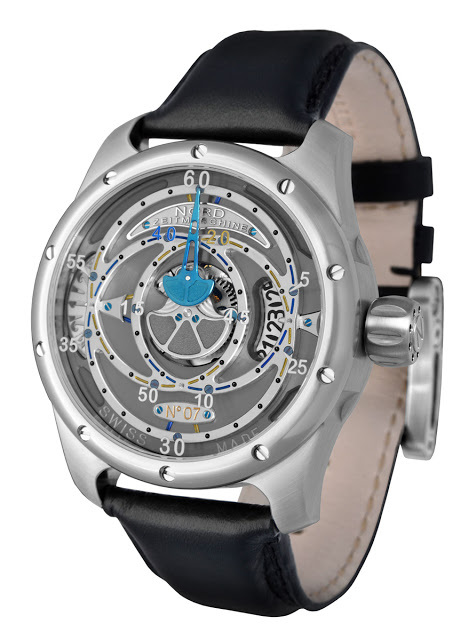 Two models are available, a time-only automatic as well as a self-winding chronograph. Various case and dial combinations are available. 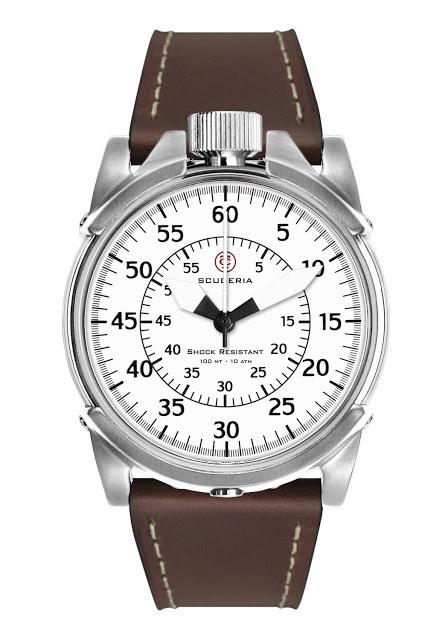 Equipped with a hand that travels more than twice as fast as a regular minute hand, the NORD Zeitmaschine Quickindicator is possibly the fastest minute hand in any wristwatch. The minute hand on the NORD Zeitmaschine Quickindicator travels at about 205 mm per hour, which is more than twice as fast as the 88 mm per hour for minute hand in a 43.3 mm Valjoux 7750-powered chronograph. Travelling on three overlapping ovoid-minute tracks, the minute hand has two axes of rotation, one of the hand itself, and the other being the rotating platform the hand is mounted on. 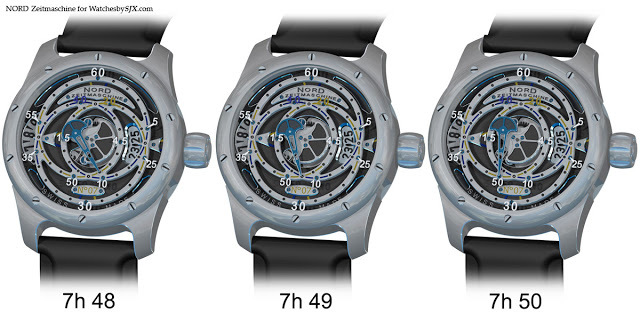 Legibility is not the strong suit of this watch, but fortunately the minutes are laser engraved and then filled with paint on the underside of the sapphire crystal, to make it easier to read. And if the hand is at the intersection of two minute tracks, the coloured bar indicates which track should be read. For instance if the minute hand points to the blue bar, then the time should be read on the blue minute track. 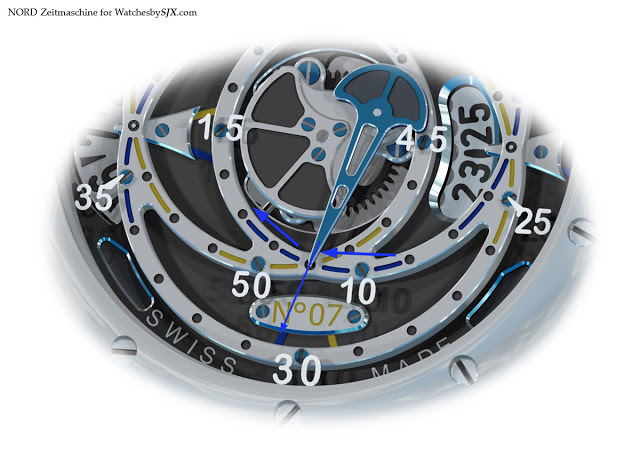 This video from NORD Zeitmaschine illustrates the movement of the minute hand. Despite being a small operation, Daniel Nebel, the founder of NORD Zeitmaschine, makes the time display module himself, as well as the case. 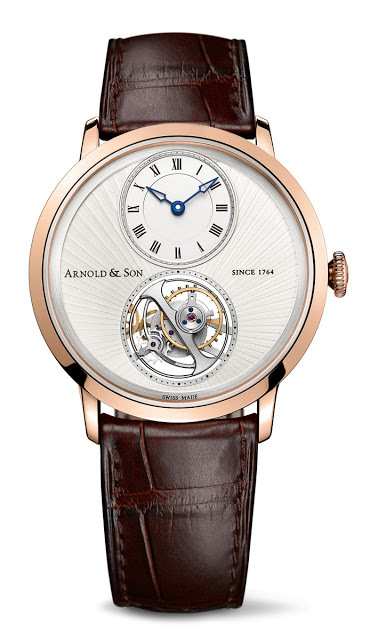 At just 8.34 mm high, the new Arnold & Son UTTE is the world's thinnest tourbillon wristwatch. Despite looking like yet another run of the mill tourbillon, the Arnold & Son UTTE (Ultra-Thin Tourbillon Escapement) is special: the watch case is just 8.34 mm thick – and the cal. 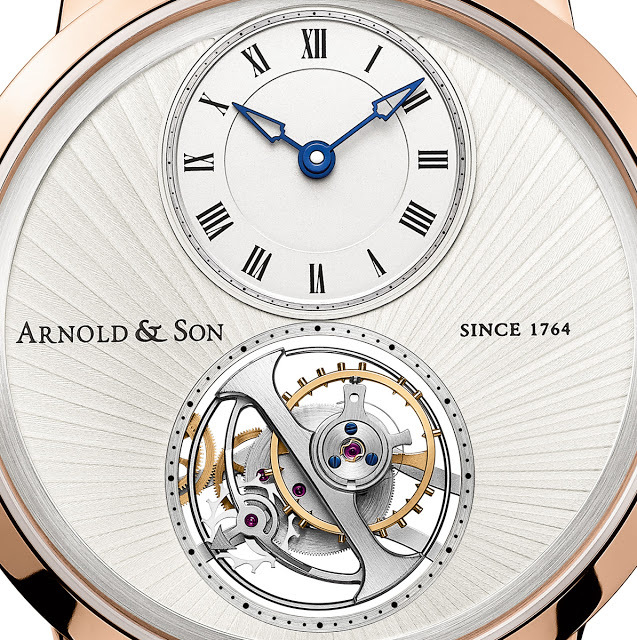 A&S8200 is a mere 2.97 mm – making it the thinnest tourbillon today. Developed by Arnold & Son’s sister company La Joux-Perret – both companies are now owned by Citizen of Japan – the flying tourbillon movement has a power reserve of 80 hours, or about three days. 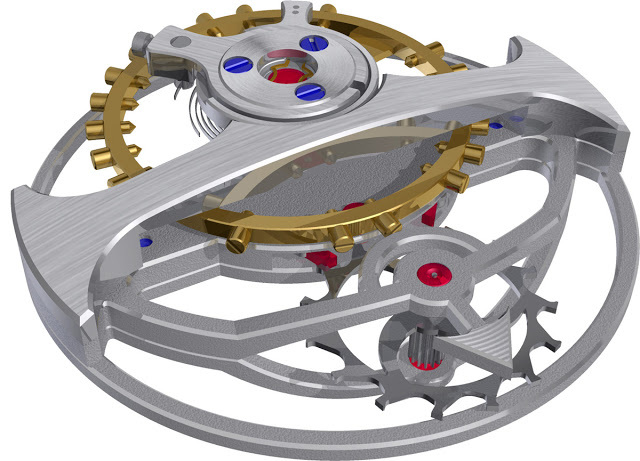 In addition, the tourbillon cage is large at 14 mm wide, nearly half the movement diameter of 32 mm. And the tourbillon carriage is positioned on a higher plane than the movement, making it level with the hands and improving its visibility. 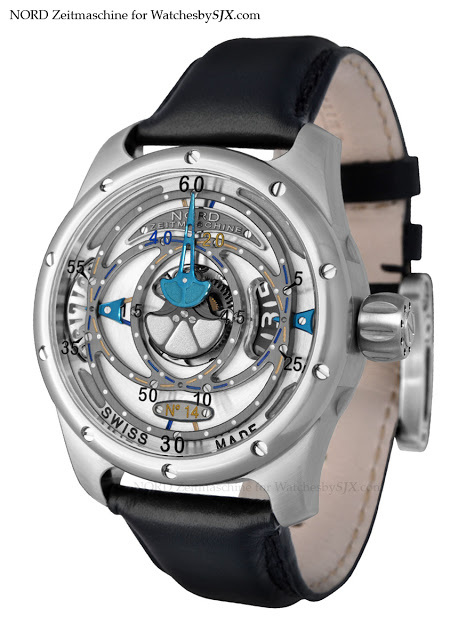 Another aesthetic feature is the lack of visible screws on the tourbillon cage. 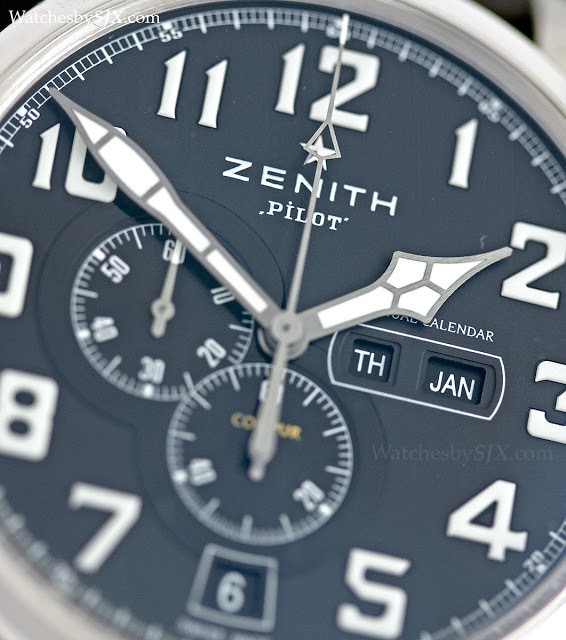 Zenith has just unveiled the pilot’s version of its El Primero-based annual calendar, the Pilot Montre d’Aéronef Type 20 Annual Calendar. 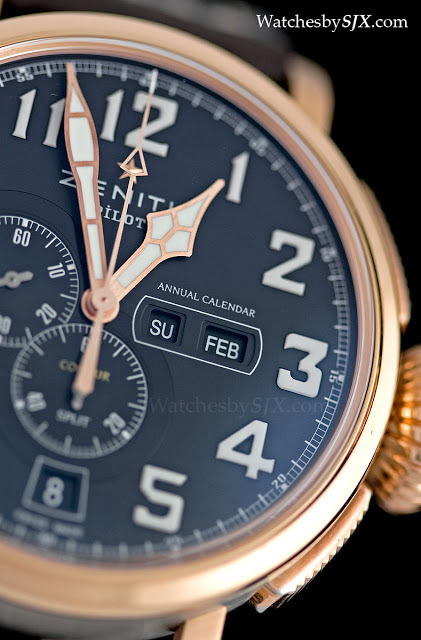 Part of the new pilot’s line, the Pilot Montre d’Aéronef Type 20 Annual Calendar features the El Primero cal. 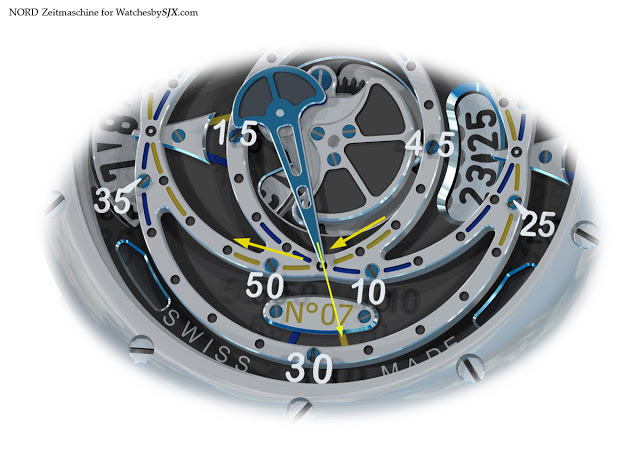 4054 movement with the condensed annual calendar module first developed by Paul Gerber for the MIH watch. 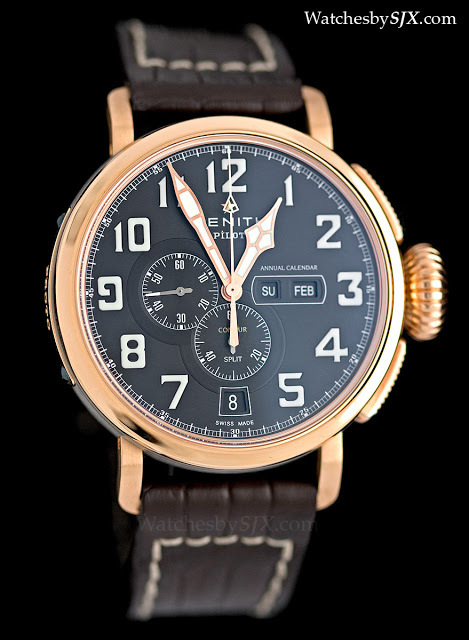 The dial contains the constant seconds sub-dial, 60 minute counter, as well as day, date and month display. 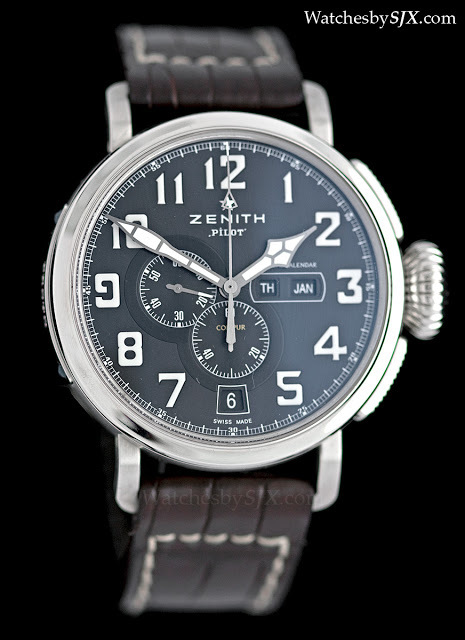 Thought this watch looks good enough, I feel Zenith lost an opportunity to give it a cleaner appearance, especially since this is a pilot’s watch. The dial appears slightly cluttered, especially with all the text. 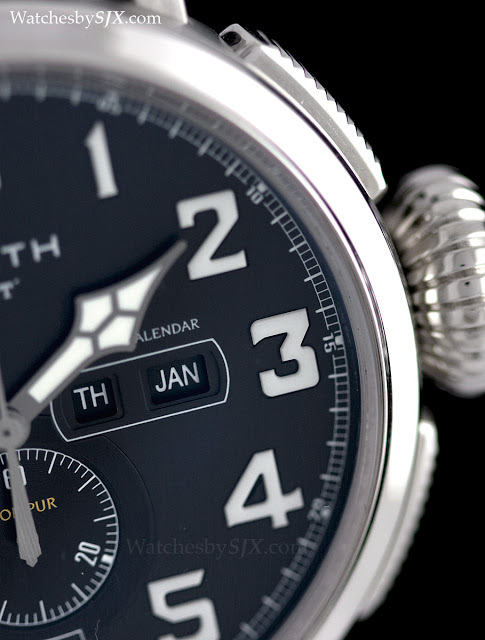 Like the new Pilot Montre d’Aéronef Type 20 GMT, the annual calendar has a 48 mm case, but wears smaller due to the short and downward curved lugs. 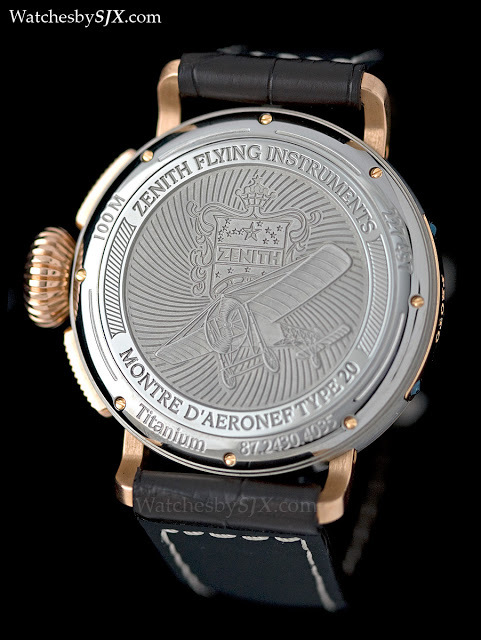 Like the rest of the Montre d’Aéronef Type 20 line, the serial number is engraved on a plate screwed into the side of the case. 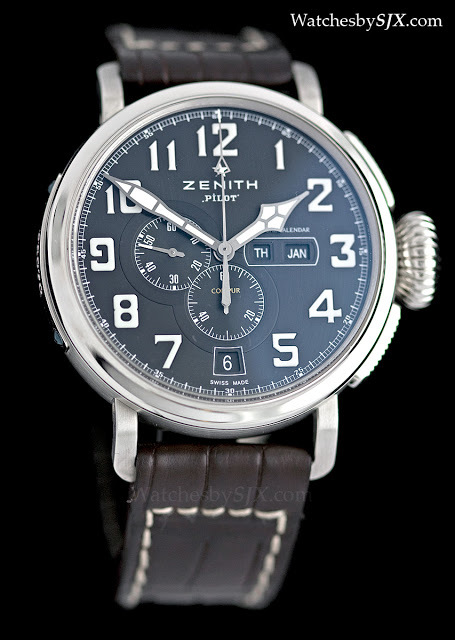 Over on the back, the aircraft Louis Bleriot piloted across the English Channel – while wearing a Zenith – is depicted in relief. 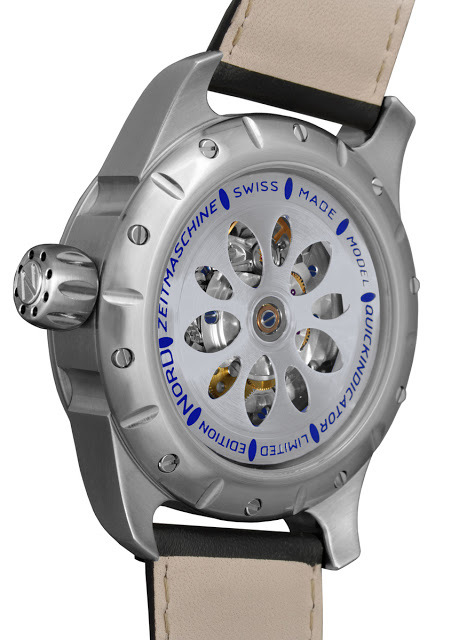 This is available in steel, which is priced at CHF9900 including Swiss VAT of 8%, a reasonable premium of CHF500 over the Captain Winsor Annual Calendar. That’s equivalent to about USD10,500. 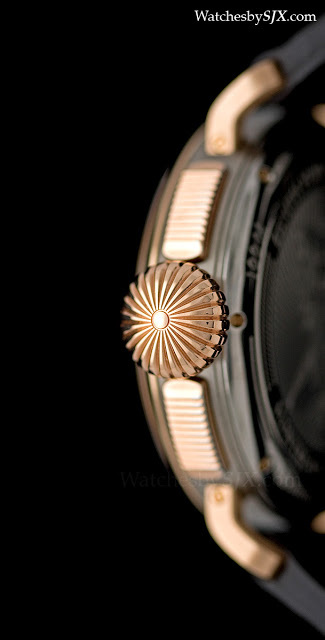 The second version is in titanium with rose gold lugs, bezel, crown and pushers, which means it looks like an all gold watch from the front. 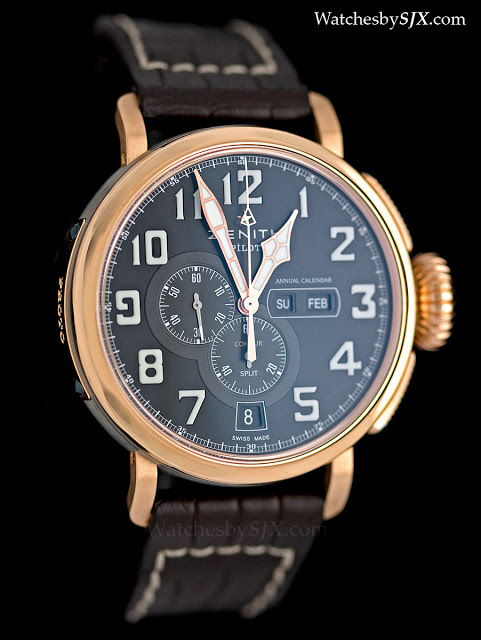 This retails for CHF21,000 with tax, which works out to about USD22,300.